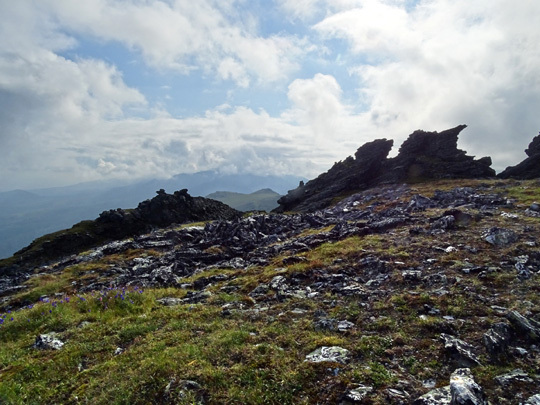 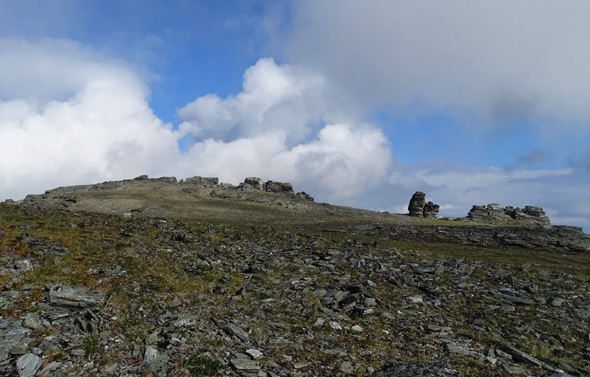 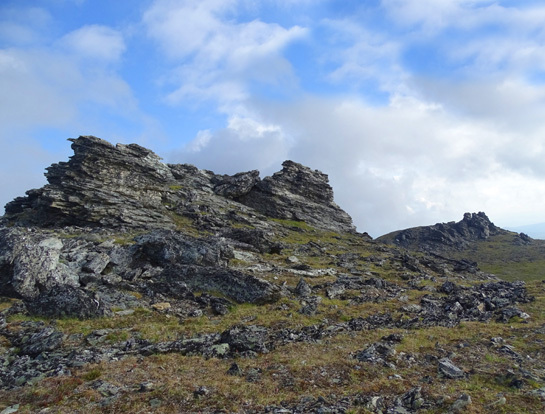 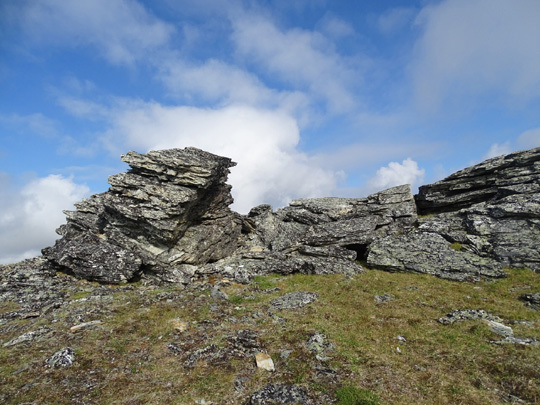 made deep within the earth's core, and some of the oldest rocks in Alaska . 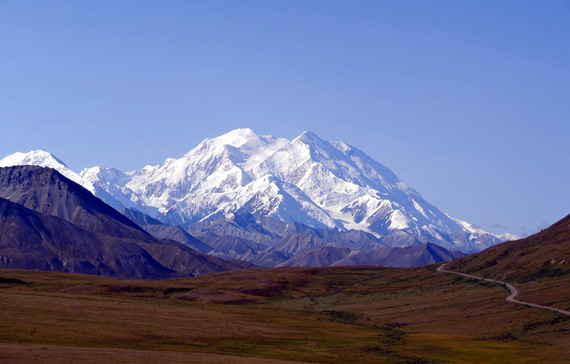 . .
showcases even if it didn't contain the highest peak in North America." 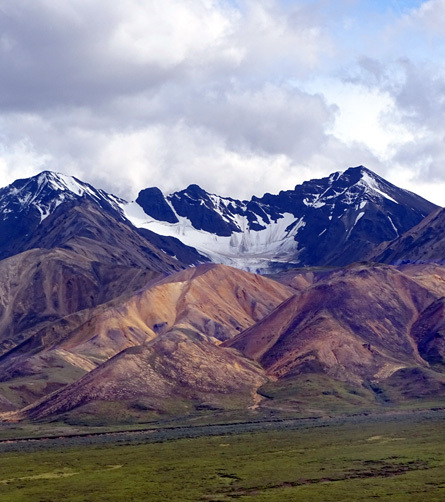 The various landforms, geologic features, and topography of this six-million acre park have been shaped over the millennia by many forces -- shifts in tetonic plates (earthquakes), fire (volcanoes), ice (glaciers), erosion (weather, wind, water), and gravity. 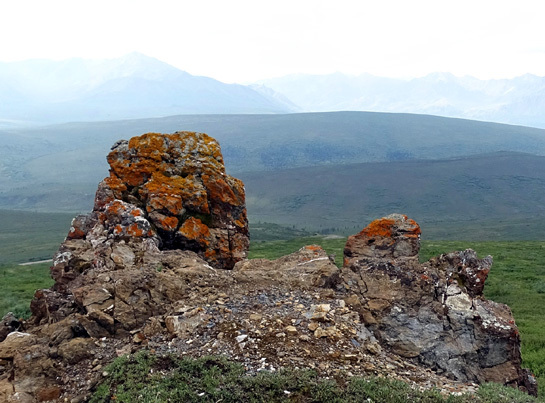 I've always been just about as fascinated with colorful and/or unusual rocks and rock formations as I have been with colorful and/or unusual flowers. 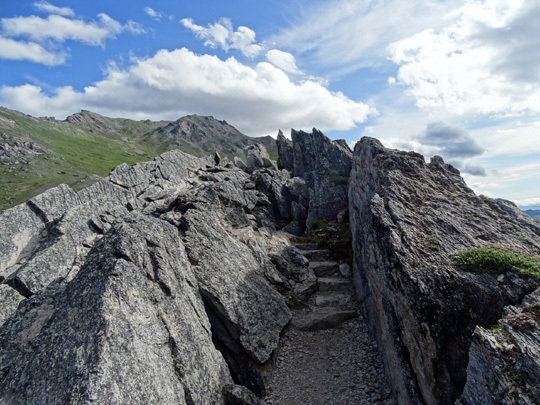 Over the years I've taken many photos of rocks and rock formations that have caught my eye. 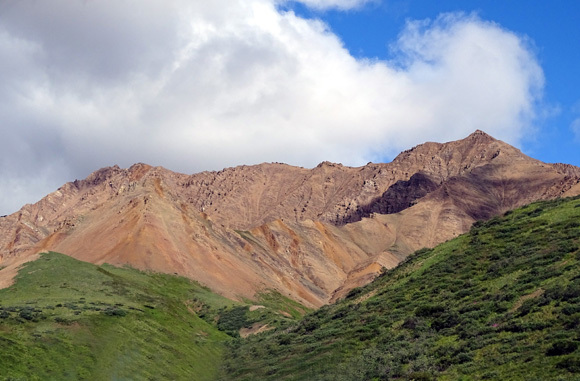 Although the ones I've admired in Alaska, and specifically Denali National Park, haven't been as spectacular as those in southern Utah or northern Arizona, they are special in their own right. 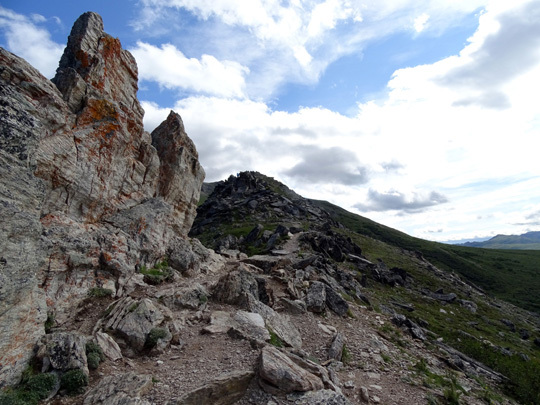 This entry showcases some of the more colorful mountains and interesting rocks and rock formations we've seen in the park in the last two weeks. 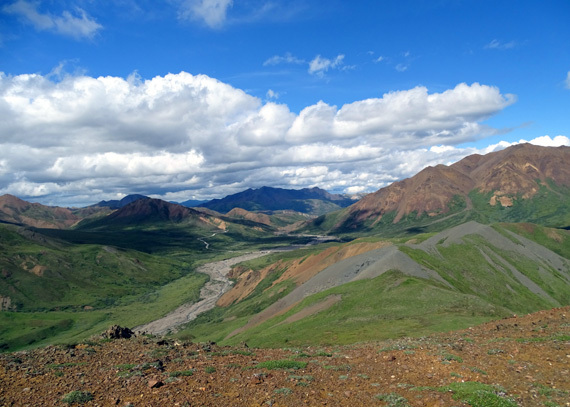 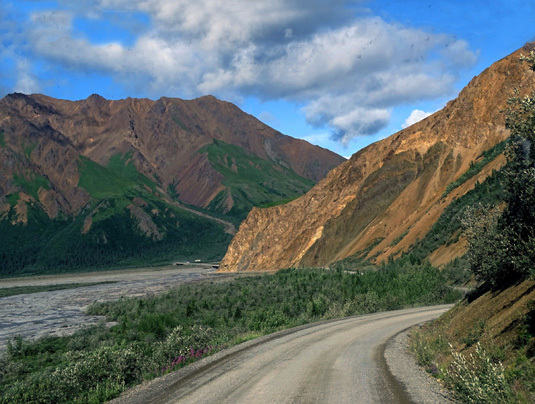 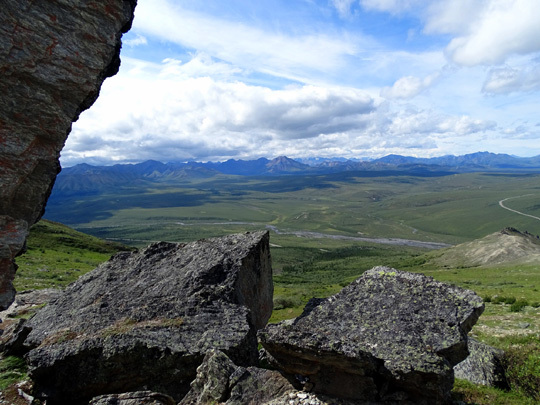 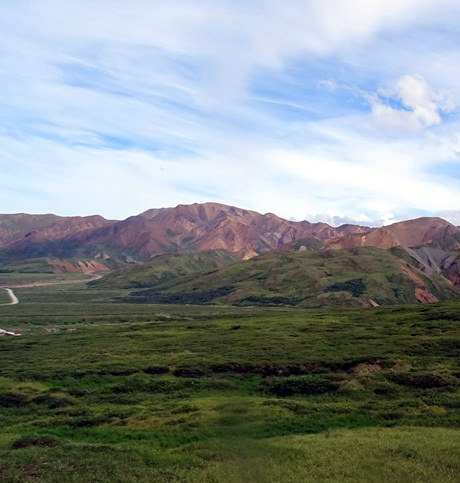 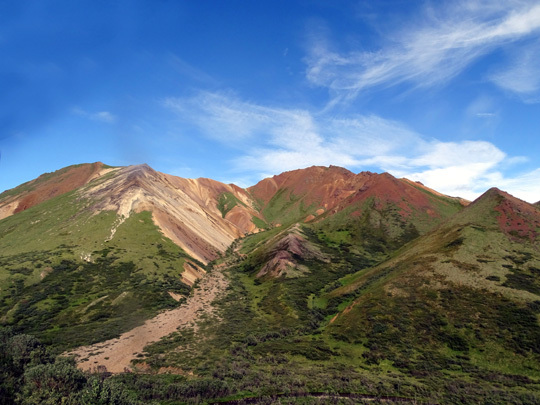 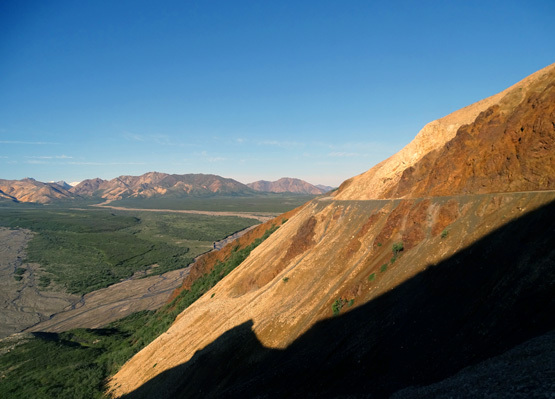 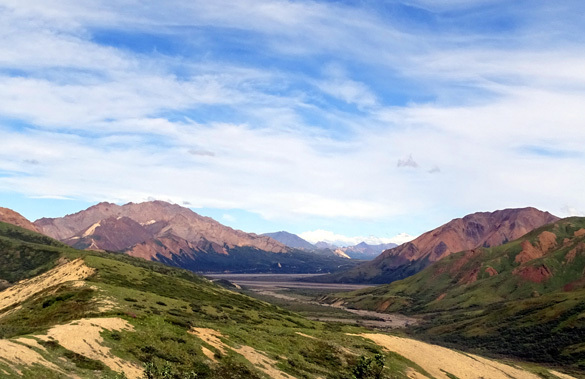 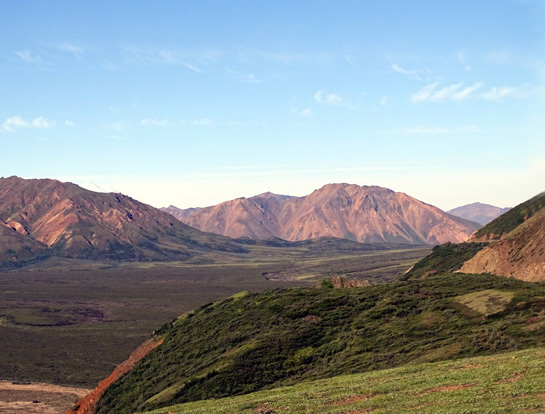 One of the best places to observe colorful rocks in Denali National Park is the aptly-named Polychrome area between the Toklat River and the East Fork of the Toklat. 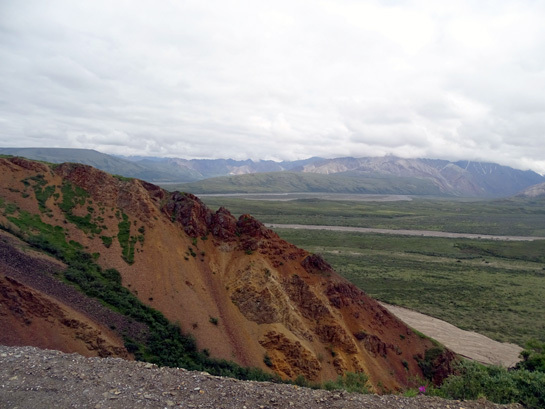 According to the website referenced above, the short but colorful mountains in this area were formed by molten rock that both hardened and eroded quickly. 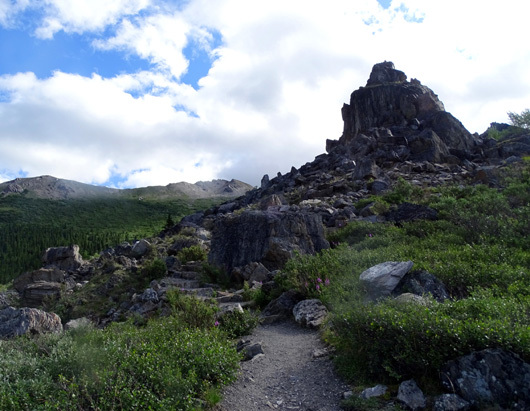 The volcanic rock is primarily basalt, rhyolite, and andesite. 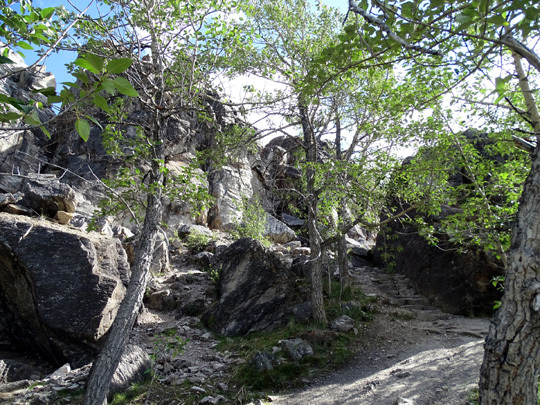 Several of the trails I hiked had large and/or interesting rock formations. 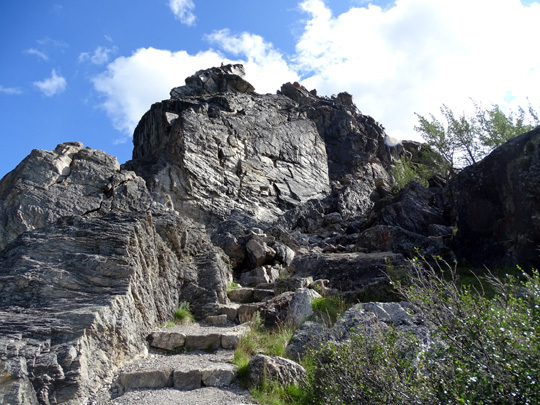 I'll feature three trails in this category and show some examples of the rock formations found there. 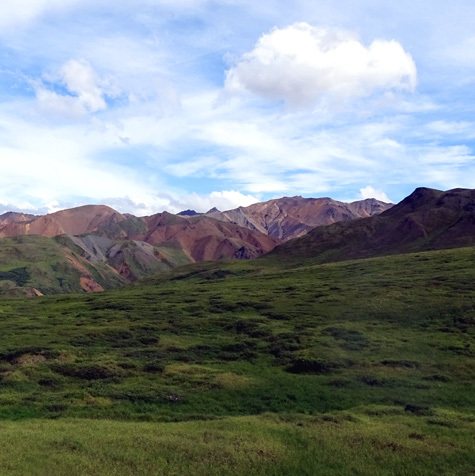 I'll start with this one since I already showed two photos from it. 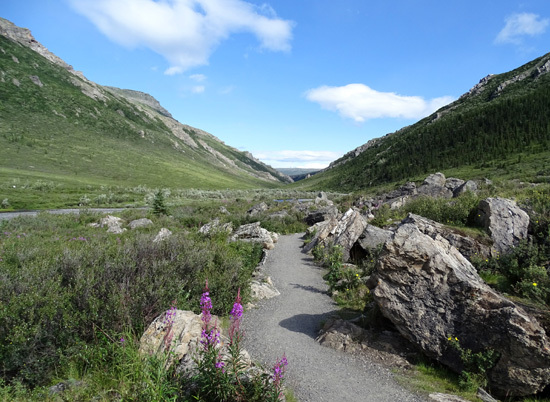 This relatively new, partial-loop trail has two trailheads. 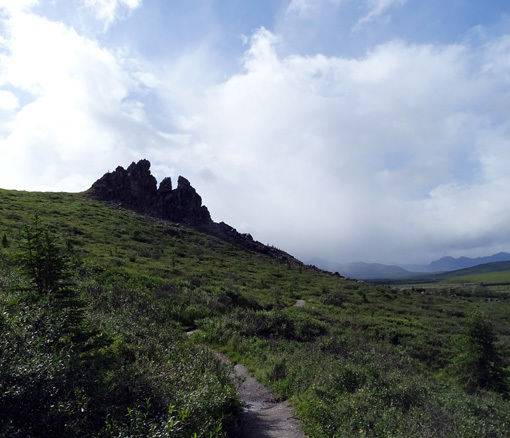 The rock formations shown here are close to the trailhead at the Savage River parking area at Mile 15 on the park road. 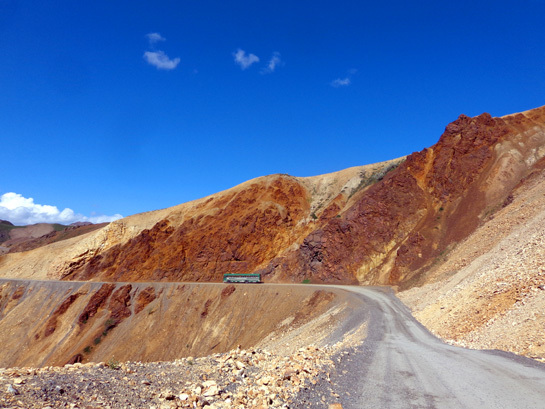 Visitors are allowed to drive their own vehicles to this location. 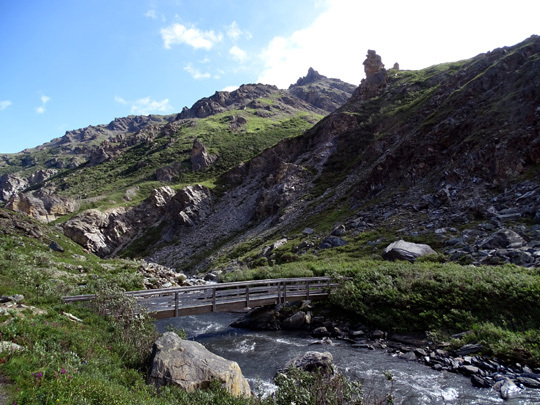 The other trailhead is near the Savage River Campground at about Mile 13 on the park road. 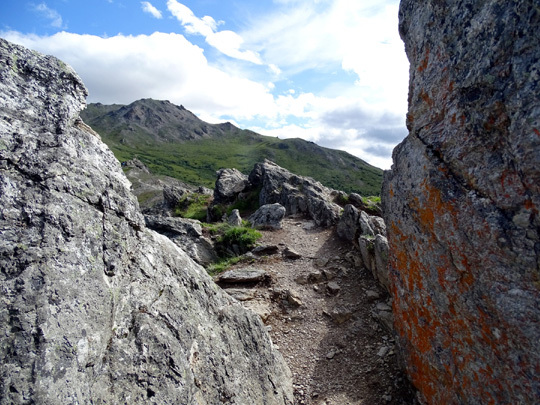 I'll show some colorful individual rocks from this trail later in this entry. 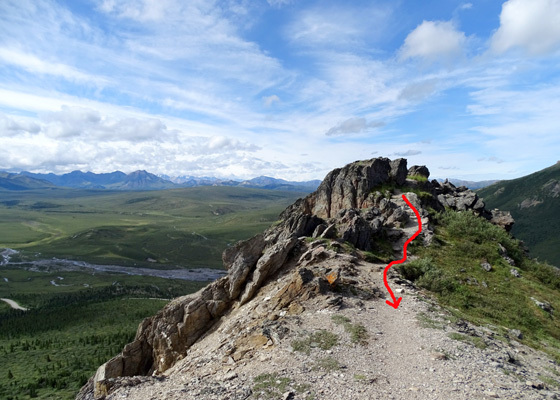 I wrote about this trail in the entry dated July 25. 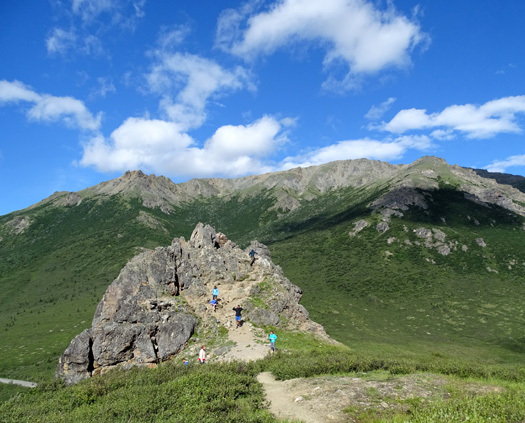 The only trail I know of on this mountain that towers above the west side of the Savage River is only a mile long and begins 2.5 miles up the road past the river. 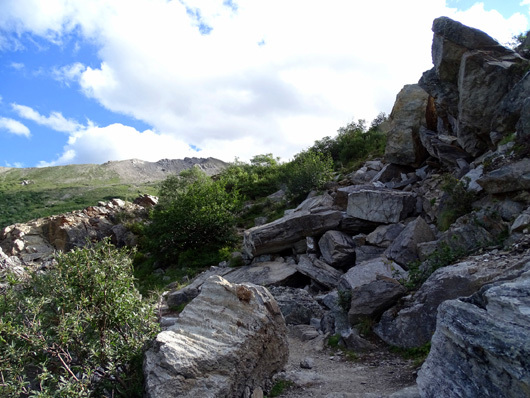 Continued on the next page: lots more really cool rocks!